10 • FOODSERVICE EQUIPMENT & SUPPLIES • MARCH 2015 people & events FE&S Names 2015 Top Achievers Foodservice Equipment & Supplies proudly introduces the winners of its 2015 Top Achiever Awards: • Top Achiever – Dealer: Chuck Day, president, Manning Brothers Food Equipment, Athens, Ga. • Top Achiever – Consultant: Tracy Taraski, manager of design services, FCSI, The Bigelow Com- panies, Kansas City, Mo. • Top Achiever – Service Agent: Gary Pettiti, president, Gary's East Coast Service, Shelton, Conn. • Top Achiever – Rep: Wayne Jones, partner, The Hansen Group, Atlanta This year's Top Achievers will ac- cept their awards during FE&S' 2015 Dealer of the Year and Industry Awards Gala, which takes place Saturday, May 16 at the Four Seasons Hotel-Chicago. 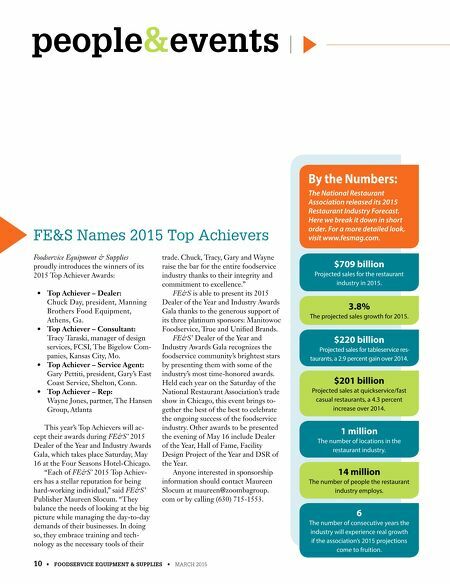 "Each of FE&S' 2015 Top Achiev- ers has a stellar reputation for being hard-working individual," said FE&S' Publisher Maureen Slocum. 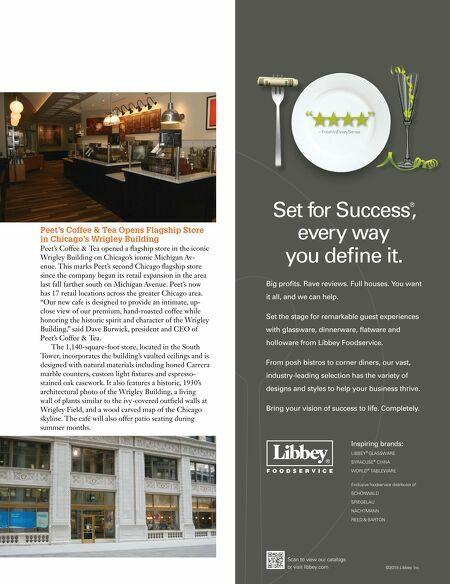 "They balance the needs of looking at the big picture while managing the day-to-day demands of their businesses. In doing so, they embrace training and tech- nology as the necessary tools of their trade. Chuck, Tracy, Gary and Wayne raise the bar for the entire foodservice industry thanks to their integrity and commitment to excellence." FE&S is able to present its 2015 Dealer of the Year and Industry Awards Gala thanks to the generous support of its three platinum sponsors: Manitowoc Foodservice, True and Unifed Brands. FE&S' Dealer of the Year and Industry Awards Gala recognizes the foodservice community's brightest stars by presenting them with some of the industry's most time-honored awards. Held each year on the Saturday of the National Restaurant Association's trade show in Chicago, this event brings to- gether the best of the best to celebrate the ongoing success of the foodservice industry. Other awards to be presented the evening of May 16 include Dealer of the Year, Hall of Fame, Facility Design Project of the Year and DSR of the Year. Anyone interested in sponsorship information should contact Maureen Slocum at maureen@zoombagroup. com or by calling (630) 715-1553. By the Numbers: The National Restaurant Association released its 2015 Restaurant Industry Forecast. Here we break it down in short order. For a more detailed look, visit www.fesmag.com. $709 billion Projected sales for the restaurant industry in 2015. 3.8% The projected sales growth for 2015. $220 billion Projected sales for tableservice res- taurants, a 2.9 percent gain over 2014. 6 The number of consecutive years the industry will experience real growth if the association's 2015 projections come to fruition. 14 million The number of people the restaurant industry employs. 1 million The number of locations in the restaurant industry. $201 billion Projected sales at quickservice/fast casual restaurants, a 4.3 percent increase over 2014.